The primary purpose of weapons is to harm: this is what weapons do, this is what they are designed to do, and the more effectively and efficiently they harm, the better they are as weapons. Weapons are exceptional in this regard, for no other artefacts are intentionally produced to do something that all of us agree is bad. If this is so, then there must be compelling reasons why weapons are made, why people design them and manufacture them. If weapons harm us, why have them? And there is only one plausible answer: we must have weapons to prevent harm. An Anti-Ballistic Missile system is a weapon to be used to shoot down or otherwise intercept ballistic missiles. There have been ballistic missiles that are not armed with nuclear warheads, such as the German V2 and various conventional Scud missiles that were used in the First Gulf War and others besides, but the main concern with ABM systems was (and is) with nuclear-armed ballistic missiles. A ballistic missile is aimed and fired and then proceeds to its target first of all under the influence of burning rocket fuel used to accelerate it and then under the influence of its inertia and gravity. The weapon is not guided in that there are no systems that identify and lock onto a target and then direct the path of the missile after it has been fired, and ballistic missiles share this feature with all other projectile weapons.20 In theory one could have ABM interceptors that were also ballistic. But this would require the most precise calculation of the flight path of the incoming warhead and then the most precise determination of the flight path of the interceptor, and this would need to take account of factors that in practice could not be determined, such as wind speed. In practice, the interceptors needed to be guided to their targets. This is also extremely challenging: the interceptors have to be very fast and highly manoeuvrable and they have to be fired at the right time and in the right direction. 1. The enemy warhead has to be detected; 2. the re-entry vehicle carrying the warhead has be to distinguished from the missile debris and penetrations aids such as decoys and chaff; 3. the path of the warhead has to be predicted into the future; 4. the interceptor has to be guided to its target; and 5. the incoming warhead has to be destroyed in a verifiable way by the explosion of a nuclear warhead (Schroeer 1984: 238). Attacking nuclear warheads are therefore to be destroyed by defending nuclear warheads, the idea being that only the latter were able to definitely destroy the incoming weapons. Defending in this way demands a substantial price, in terms of nuclear fallout and other damage, such as massive disruption to communication, but presumably better that actually receiving the incoming warheads. The US began to develop a two-layered system based on these principles in 1959, which was partially deployed in 1971, but abandoned a year later under the 1972 treaty to ban ABM systems. A two-layered system is one that comprises two completely independent subsystems sharing no common components and operating at different ranges, the idea being that the warheads missed by the longer range interceptors would be mopped up by the shorter range weapons. I said I would consider ABM systems as a possible example of a purely defensive system, having claimed that what counts as a defensive weapon depends on the context in which it is in place, from which it follows that there are no purely defensive systems. 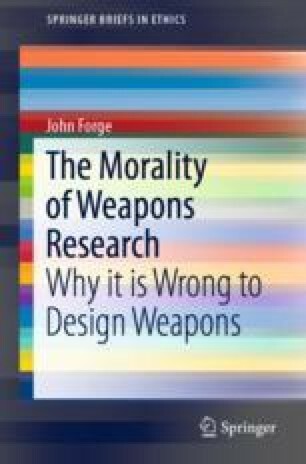 Having made the point that defensive missions, tactics, etc., are (usually) necessary for aggressive wars of conquest, it may seem that we do not really need to worry about pure defence anymore, because that is now seen not to be able to justify weapons research. However, this example is instructive because of the way in which it confirms the view that what counts as a defence depends on the context, and in the case of ABM systems, the context is informed by strategic or even grand strategic considerations. I will get on to that issue in a moment. Note first that the technologies needed to set up an ABM systems have much in common with those needed for an offensive nuclear missile capability. These include the nuclear warheads for the interceptors, which must be small, be able to detonated at just the right moment and resilient enough to stand up to the high acceleration of the interceptor missiles. The missiles themselves were, for the US system just mentioned, adapted from submarine-based missile technology (Schroeer 1984: 237). Thus the interceptors could be turned back into offensive systems with some modification. The reason why it was possible for the superpowers to agree to a ban on ABM systems was that they were generally accepted to be extremely destabilising, that is to say, make nuclear war more likely. The reason ABM systems are destabilising is because they would not be ‘leak-proof’, that is, they could never in practice be guaranteed to intercept all incoming warheads: some were bound to get through.21 By contrast, a leak-proof system would be profoundly stabilising because nuclear weapons would have been rendered, to use the famous words of President Ronald Reagan, impotent and obsolete (providing everyone had such a system). But an imperfect ‘leaky’ system was thought to encourage the possessor to launch a first strike at its opponent’s nuclear arsenal, either the US or USSR given that we are talking about the period of the Cold War. Assuming that such a strike is not completely successful and retaliation follows, the thinking was that the ABM system would manage to intercept most of the surviving warheads, and damage caused by the relatively few that got through would be ‘acceptable’. The advantage would be that an implacable and dangerous enemy, either the US or USSR, would have been eliminated. This way of thinking is surely very strange: any form of reckoning that countenances just one nuclear warhead landing on one’s territory—on Moscow or New York for example—has gone off the rails in a serious way. But such was Cold War nuclear strategy, and it demonstrates clearly how defence against nuclear weapons could not be separated from the management of offensive systems: the context is everything.